When we first moved to Montana we didn’t realize how hard it would be to live with the deer, in terms of gardening, that is. After a few years of gardening in denial, I finally realized that I was going to have to fence whatever I didn’t want the deer to eat. I used to buy plants that have that nifty little symbol of the deer in the red circle with the line across it, meaning the deer wouldn’t eat that plant. Yeah, right. Bleeding Heart. They grow well with ferns as both like shade and moisture. And they grow really fast! The only things my particular deer population won’t eat (so far as I’ve discovered) are Bleeding Hearts, ferns, daffodils and lavender. And sweet woodruff, which is a groundcover that has pretty white blooms. 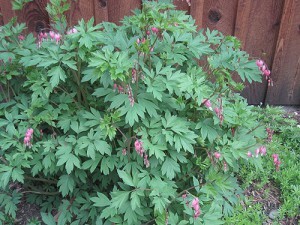 And lambium, which is also groundcoverish and has pretty pink blooms. So okay. There are a few things I can get away with outside my fenced area, and in 14 years this is all that I found that is safe. Luckily, all the greenery looks good against the cedar-stained siding of my house. I could also have white daisies but they are considered a weed here and they take over everything so I now pull those without ceremony. Every day is Turkey Day at the ranch these days. 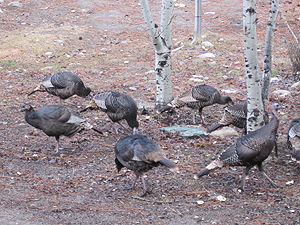 The turkey herd (is it a herd?) that lives in the neighborhood have started visiting twice a day, minimum, since I put out birdfeeders a few months ago. They come around to scrounge up the stuff that spills out of the feeders. 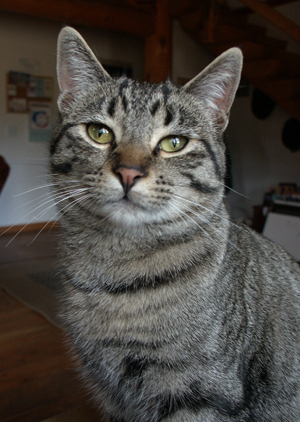 They’re kind of skittish but they don’t seem to mind the construction mess and noise too much. I can even go out there while they’re here and throw out some more food on the ground. That’s when the fun starts! These turkeys are rather vicious to each other. They’re fat and sassy and they have attitude. They also have no compunction about leaving turkey poop all over the place. Molly thinks it’s a buffet. Ewww! Every spring and fall, a couple of Stellars Jays come to visit, sit on the porch railing, and scream at me to give them something to eat. They usually stay a week or so and then they’re gone. This year, I put out some cute birdfeeders that I got from Gardener’s Supply and the jays have stopped screaming and started pigging out. The new feeders are just like a glass tire shape and the feed sits in the bottom. The birds can sit on the edge or jump inside and pig out. I have mine hanging in the aspen trees out front. This one jay couldn’t figure out how to get inside the bird feeder, so he hopped around the branches awhile, then started bouncing on a branch near the feeder. As he bounced close to the feeder, he would stick his head inside and grab a bite of food. It was hilarious! I wish I could have gotten a movie of this bird desperately bobbing on the branch, just trying to get another bite. After a few days, he finally figured out that he could just hop inside. 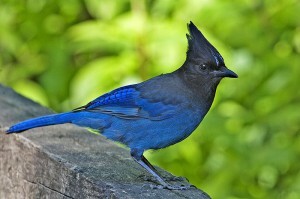 I always thought Stellars Jays were migratory birds because I only saw them briefly in the spring and fall. Now that I have food out on a regular basis, they’ve stuck around. I felt kind of guilty, like I was throwing them off their migration schedule and they’d be stuck here all winter, huddling together with little hats and scarves on to stay warm. But my bird book says they don’t migrate…whew! Now they only scream at me when the feeders run low.